Some professional poker players are about to play a game with high stakes: a $200,000 prize — and finding out if they’re smarter than a machine. Starting on January 11 at Rivers Casino in Pittsburgh, professional players are going to match their skills and deal cards with an A.I. in “Brains Vs. Artificial Intelligence: Upping the Ante.” This poker-playing computer program, named Libratus, was developed by a team of Carnegie Mellon University researchers led by computer science professor Tuomas Sandholm. The last time Brains Vs. A.I. was held in 2015, the human players won. A.I. program Claudico collected fewer chips than three out of four of the pros who competed. But the A.I. is returning for a rematch. In 2015, the competitors only played 80,000 hands, but the number is getting upped to more than 120,000 this year’s contest. This reduces the possibility that either the human players or the A.I. won by luck. 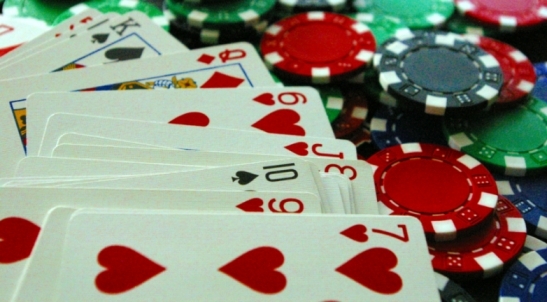 And Libratus, named after a Latin term for balanced and powerful, is programmed with a new algorithm that computes better strategies for poker and other problems that have incomplete or misleading information. This year, poker players Jimmy Chou, Dong Kim, Jason Les and Daniel McAulay will play tens of thousands of hands of Heads-Up No-Limit Texas Hold-em over 20 days. If these Heads-Up No-Limit Texas Hold’em specialists win, they will split the $200,000 prize. Claudico, the A.I. used in 2015, favored the limping strategy, which means getting into a hand by calling, rather than raising or folding. Like Claudico, Libratus will also limp, but Libratus’ algorithm incorporates new technology that can attain Nash equilibrium. This strategy means that neither player can benefit from changing strategy, as long as the other player’s strategy stays the same. Claudico also made some bluffs that were too obvious and easy to exploit. But Libratus can compute better endgame strategies — and maybe collect more chips. A.I. can now drive cars, plan meals and even fall in love with each other. But can it beat the pros in poker? We’ll find out at the end of this month.